A Revinate client since 2011, The Florida Hotel & Conference Center was one of the first customers to adopt Revinate On-Site Surveys, an innovative iPad solution for capturing guest feedback during the stay or visit. 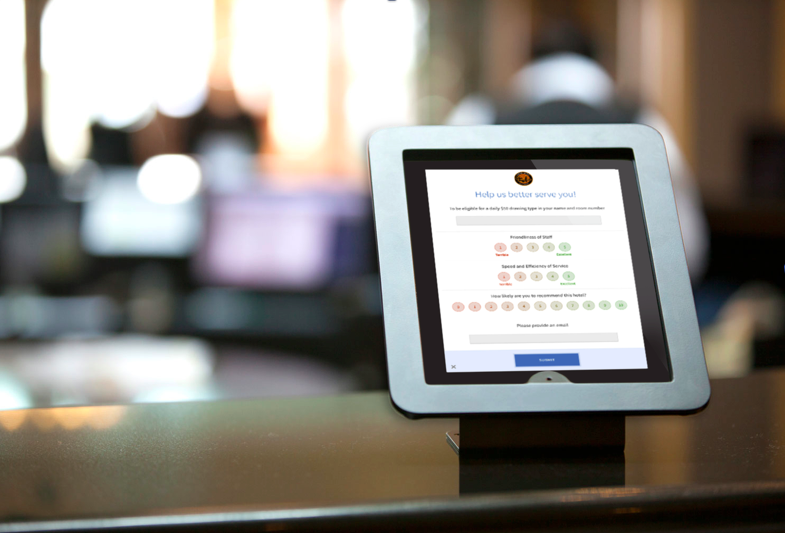 With On-Site Surveys, hotels can collect real-time feedback from customers or day visitors, and with real-time alerts, staff can be notified of guest comments that require immediate attention. To ensure that the hotel captured a high volume of feedback, On-Site Survey locations were selected based on service points where the hotel knew it could grab the guest’s attention. The locations included the elevator landing on a guest room floor, close to the pick-up counter at Starbucks, near the cash register in the convenience store, and even in a crowded bar. The response rates showed that guests are responding well to several On-Site Survey locations; one location saw nearly 3,000 guest comments come in over a 3-month period. The Florida Hotel & Conference Center then is able to analyze and learn from these guest comments with Revinate. On-Site Surveys insight is fully integrated with Revinate’s reporting and provides hotels with a full, 360-degree view of customer feedback. This forward-thinking ability affords hoteliers greater future customer insight that they can leverage to drive guest loyalty and provide exceptional future stays.